The UsuryFree Eye Opener: Are You A Grateful Slave? My master is a good man. He gives me food, shelter, work and other things. All he requires in return is that I obey him. I am told he has the power to control my life. I look up to him, and wish that I were so powerful. My master must understand the world better than I,because he was chosen by many others for his respected position. I sometimes complain, but fear I cannot live without his help. He is a good man. My master protects my money from theft, before and after he takes half of it. Before taking his half, he says only he can protect my money. After taking it, he says it is still mine. When he spends my money, he says I own the things he has bought. I don't understand this, but I believe him. He is a good man. I need my master for protection, because others would hurt me. Or, they would take my money and use it for themselves. My master is better than them: When my master takes my money, I still own it. The things he buys are mine. I cannot sell them, or decide how they are used, but they are mine. My master tells me so, and I believe him. He is a good man. My master provides free education for my children. He teaches them to respect and obey him and all future masters they will have. He says they are being taught well; learning things they will need to know in the future.I believe him. He is a good man. My master cares about other masters, who don't have good slaves. He makes me contribute to their support. 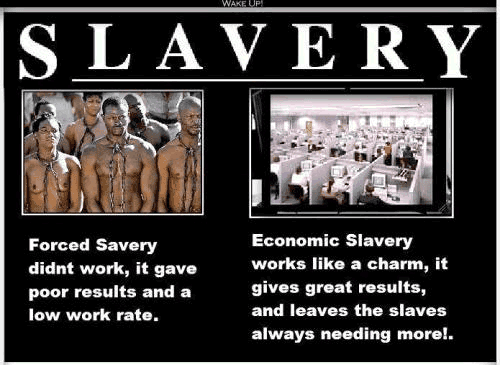 I don't understand why slaves must work for more than one master, but my master says it is necessary. I believe him. He is a good man. Other slaves ask my master for some of my money. Since he is good to them as he is to me, he agrees. This means he must take more of my money; but he says this is good for me. I ask my master why it would not be better to let each of us keep our own money. He says it is because he knows what is best for each of us. We believe him. He is a good man. My master tells me: Evil masters in other places are not as good as he; they threaten our comfortable lifestyle and peace. So, he sends my children to fight the slaves of evil masters.I mourn their deaths, but my master says it is necessary. He gives me medals for their sacrifice, and I believe him. He is a good man. Good masters sometimes have to kill evil masters, and their slaves. This is necessary to preserve our way of life; to show others that our version of slavery is the best. I asked my master: Why do evil masters' slaves have to be killed, along with their evil master? He said: "Because they carry out his evil deeds." "Besides, they could never learn our system; they have been indoctrinated to believe that only their master is good. "My master knows what is best. He protects me and my children. He is a good man. My master lets me vote for a new master, every few years. I cannot vote to have no master, but he generously lets me choose between two candidates he has selected. I eagerly wait until election day, since voting allows me to forget that I am a slave. Until then, my current master tells me what to do. I accept this.It has always been so, and I would not change tradition. My master is a good man. At the last election, about half the slaves were allowed to vote. The other half had broken rules set by the master, or were not thought by him to be fit. Those who break the rules should know better than to disobey! Those not considered fit should gratefully accept the master chosen for them by others. It is right, because we have always done it this way. My master is a good man. There were two candidates.One received a majority of the vote - about one-fourth of the slave population. I asked why the new master can rule over all the slaves, if he only received votes from one-fourth of them? My master said: "Because some wise masters long ago did it that way." "Besides, you are the slaves; and we are the master." I did not understand his answer, but I believed him. My master knows what is best for me. He is a good man. Some slaves have evil masters. They take more than half of their slaves' money and are chosen by only one-tenth, rather than one-fourth, of their slaves. My master says they are different from him. I believe him. He is a good man. I asked if I could ever become a master, instead of a slave. My master said, "Yes, anything is possible." "But first you must pledge allegiance to your present master, and promise not to abandon the system that made you a slave." I am encouraged by this possibility. My master is a good man. He tells me slaves are the real masters, because they can vote for their masters. I do not understand this, but I believe him. He is a good man; who lives for no other purpose than to make his slaves happy. I asked if I could be neither a master nor a slave. My master said, "No, you must be one or the other." "There are not other choices." I believe him. He knows best. He is a good man. I asked my master how our system is different, from those evil masters. He said: "In our system, masters work for the slaves." No longer confused, I am beginning to accept his logic. Now I see it! Slaves are in control of their masters, because they can choose new masters every few years. When the masters appear to control the slaves in between elections, it is all a grand delusion! In reality, they are carrying out the slaves' desires. For if this were not so, they would not have been chosen in the last election. How clear it is to me now! I shall never doubt the system again.